The 1982-83 and 1997-98 El Niños brought very high precipitation to Californias central coast; this precipitation resulted in raised groundwater levels, coastal flooding, and destabilized slopes throughout the region. Large landslides in the coastal mountains of Big Sur in Monterey and San Luis Obispo Counties blocked sections of California State Route 1, closing the road for months at a time. Large landslides such as these occur frequently in the winter months along the Big Sur coast due to the steep topography and weak bedrock. A large landslide in 1983 resulted in the closure of Highway 1 for over a year to repair the road and stabilize the slope. Resulting work from the 1983 landslide cost over $7 million and generated 30 million cubic yards of debris from landslide removal and excavations to re-establish the highway along the Big Sur coast. 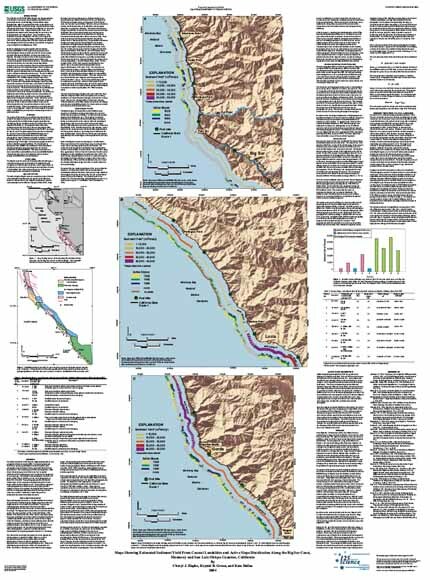 Before establishment of the Monterey Bay National Marine Sanctuary (MBNMS) in 1992, typical road opening measures involved disposal of some landslide material and excess material generated from slope stabilization onto the seaward side of the highway. It is likely that some or most of this disposed material, either directly or indirectly through subsequent erosion, was eventually transported downslope into the ocean. In addition to the landslides that initiate above the road, natural slope failures sometimes occur on the steep slopes below the road and thus deliver material to the base of the coastal mountains where it is eroded and dispersed by waves and nearshore currents. Any coastal-slope landslide, generated through natural or anthropogenic processes, can result in sediment entering the nearshore zone. The waters offshore of the Big Sur coast are part of the MBNMS. Since it was established in 1992, landslide-disposal practices came under question for two reasons. The U.S. Code of Federal Regulations, Title 15, Section 922.132 prohibits discharging or depositing, from beyond the boundary of the Sanctuary, any material or other matter that subsequently enters the Sanctuary and injures a Sanctuary resource or quality. The landslide-disposal practices previously used had the potential to alter nearshore zone habitat by converting marine habitats from rocky substrate to soft bottom. In addition, the disposal practices had the potential to increase concentrations of suspended sediment in the nearshore zone, and thereby possibly impact coastal biological communities. On the other hand, natural mass-wasting processes, including coastal cliff erosion coastal and landslides, as well as streams deliver sediment to the coast in unknown quantities and thus provide nutrients as well as source material for beaches. Current road maintenance and repair practices along the Coast Highway 1 corridor that restrict disposal of material within the MBNMS may actually reduce sediment input relative to natural processes.